On paper the X-A5 looks pretty average, with average specs, an average price and a fairly predictable take on the low-end mirrorless camera. What elevates it above the ordinary, however, is its excellent image quality and the fact that you can capture sharp, well-exposed shots without really trying. 4K video at 15fps – what’s the point? Fujifilm is pretty clear about its target audience for the X-A5. Its features, brochure and promotional materials are all targeted heavily at Instagram influencers and female family ‘record keepers’, rather than gadget-obsessed males. So let’s not knock it. This is a big audience that's as deserving of good camera kit as anyone else, and the X-A5’s features need to be looked at with this audience in mind. The slogan in the X-A5 brochure is “Whenever, Whatever, Whichever, However, Wherever… and Forever!”, and you’ve got to admit that’s pretty catchy. 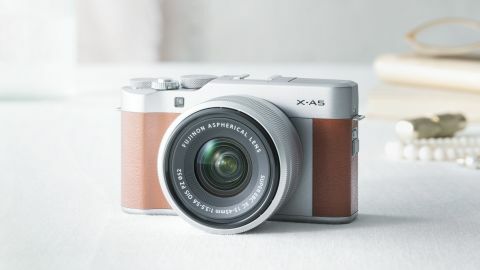 Perhaps the first thing to note about the X-A5 is that this is another (yes, another) beginner-friendly mirrorless camera with no electronic viewfinder, just an LCD screen on the rear for composing photos. And while serious photographers might not be impressed, the X-A5 isn’t designed for them – it’s designed for smartphone upgraders who are used to touchscreen interfaces and don’t mind that kind of arm’s-length photography. Inside, the X-A5 has a regular CMOS sensor, not one of Fujifilm’s more advanced X-Trans sensors as found in the likes of the X-T20. We’ve seen this before on Fujifilm’s entry-level models, and we’d be surprised if anyone but a photography expert could spot the difference in image quality. It’s what’s on the front that’s more interesting. The X-A5 comes with a new retracting 15-45mm power zoom kit lens. That’s equivalent to around 23-68mm in full-frame terms, so it’s a little wider than the average kit lens, and a little shorter at its longest focal length. The extra angle of view makes it handy for cramped interiors and narrow city streets, and you can always get the Fujinon XC 50-230mm f/4.5-6.7 OIS II telephoto zoom for when you need something a little longer. The real story here is the kit lens’s size and weight: when fitted to the X-A5, the all-up weight of this camera-lens combination is just 496g. Even better, the retracting design means the X-A5 will take up a lot less space in a bag than with Fujifilm’s previous entry-level 16-50mm lens, which doesn’t retract and is a good deal longer, attached. The X-A5 with kit lens is now about the same size as the Canon EOS M100 with Canon’s retracting 15-45mm lens, though not quite as small as the Olympus E-PL9 with Olympus’s 14-42mm EZ pancake zoom. Fujifilm’s retracting kit lens design might not sound like a particularly big deal, but it suddenly makes the X-A5 a whole lot more appealing as a take-anywhere camera, and pitches it right up against the best of its rivals. Other key features include a rear screen that flips up through 180 degrees to activate a selfie mode (there’s a Portrait Enhancer mode for smoother skin, too), a macro mode for photographing objects as little as 5cm away, and a wide range of exposure modes for different situations and skill levels. You can select the SR Auto mode to let the camera take care of everything, select a scene mode manually from the 14 available, experiment with Advanced Filters like Fog Remove, CrossScreen, Dynamic Tone, Soft Focus, Low-key, Toy Camera, HDR Art and POP Color, or switch to the regular program AE, aperture priority, shutter priority or manual modes when you want to take control yourself. You also get to choose from Fujifilm’s highly-regarded Film Simulation modes, including Provia, Velvia, Astia, Classic Chrome, Pro Negative, Monochrome and Sepia (though not the new ACROS black and white mode introduced on Fujifilm cameras further up the range). Fujifilm has a long history of making film, as well as cameras, and it does trade heavily on the film-like look of these Film Simulation modes. The X-A5 may not have the X-Trans sensor found in more advanced Fujifilm cameras, but it does have fast phase-detection autofocus, offering a variety of focus patterns including a Wide/Tracking mode, Zone AF over a smaller area and Single Point AF, all using various combinations of 91 individual AF points that extend almost to the edges of the frame. The camera’s continuous shooting speed for full-resolution still images is 6fps, but there's also a 4K Burst Shooting mode, perhaps inspired by Panasonic’s 4K Photo mode, which can capture 8-megapixel 4K images at 15fps. On the downside, while the X-A5 does shoot 4K video, it’s only at 15fps That’s a major disappointment, and makes its 4K video capability largely useless except for high-speed stills. If you want smooth video you have to downsize to Full HD, although here the X-A5 can shoot at up to 60fps for a 2x slow motion effect. The X-A5 also has the electronic shutter found in other Fujifilm models, with a maximum speed of 1/32,000 sec. Due to the way it works, however, it’s not suitable for fast-moving subjects; instead it's designed to allow you to use wide lens apertures for a shallow depth of field even in bright light.